Happy Groundhog Day	 Today is my favorite holiday....Happy Groundhog Day! I had a cookie-cake thingy baked and decorated special, to help my coworkers all celebrate with me. Isn't it pretty? And festive? 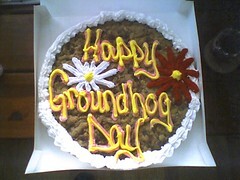 I hope everyone has a groovy groundhog day, with many groundhog festivities, groundhog treats, and groundhog gifts. Or, at least, I hope we all have a delightful day largely devoid of over-commercialization. The only downside to this lovely day is that we have to face six more weeks of winter. edited to add: Why is Groundhog Day my favorite holiday? There is no religion or country or philosophy that its based on; it's something that can be embraced by everyone. Also (aside from in Punxsutawney) it is one of the least commercialized holidays out there! There are no gifts to buy, meals to make, cards to send. No obligations or expectations, no stress -- just good clean fun. read 32 comments | talk to me! So tell us, why is Groundhog Day your favorite holiday? Grilled Groundhog with garlic, roesmary and lime. Roast Groundhog with cranberry apple stuffing. You think it'd be good? I've never had groundhog myself. Actually I don't think I've eaten any rodents. Seems like they wouldn't be all that tasty, or more people would be feasting on them already. Enjoy your favorite holiday! I'm planning an extra special celebration involving clog dancing around the nearest groundhog hole! Gosh that sounds like fun. *wistful sigh* Maybe I'll do that next year! Since it's my sister's birthday I always celebrate Groundhog's Day. Very overcast here today, so if we had a groundhog, we'd have a early spring. Thread started by Bob T.
... my favorite quote from the movie "Groundhog Day." "What would you do if you were stuck in one place, and everyday was exactly the same, and nothing you did mattered?" "That about sums it up for me." Any left overs on that cookie????? A celebration without a Wal/Mart tie in. Yummmm....nope, no leftovers, sorry! Too bad, 'cause it was good.